All New Appliances & Washer, Dryer 2019. One Covered Parking Space. New mattresses 2017.Master Bedroom Has King Bed, Second Bedroom Has Two Queen Beds, and Third Bedroom Has 2 Twin Beds. All bedrooms Have Flat Screen TV's & Ceiling Fans. New black Leather sofa has 4 sections, 2 electric recliners and the 2 separate rockers that recline. . Private Laundry Room in Unit. .Bath rooms updated. Master bath has new double vanities and walk in shower. 2nd bath has new double vanities and tub w/shower. There are large glass windows and sliding glass doors across practically the entire unit. Because we are on the second floor this allows us to see the water from the kitchen, dining room, living room and master bedroom. Almost everyday we see the dolphins feeding. 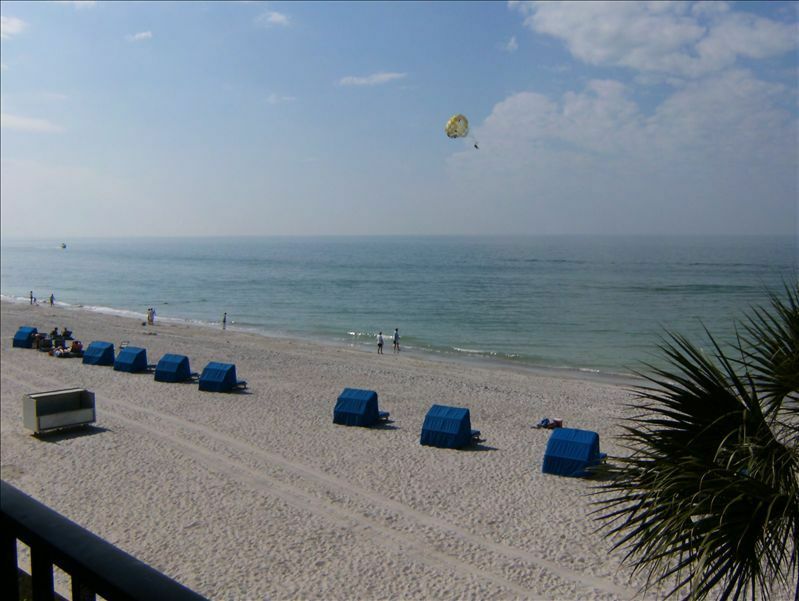 If its a windy day you will probably see some wind surfers out on the water, Can rent paddle boards and cabanas on beach. Beach chairs, beach towels , umbrella and beach toys are in closet' Beach cabanas are for rent on beach. This condo is owners winter home (Dec thru March,) It is deep cleaned every year, all repairs made and appliances yearly checkup by insurance paid contract. No need for a car. Grocery store(Winn Dixie), drug store, dollar store and several restaurants and a couple of pubs , all within walking distance. Good golf courses. Tampa airport 30 minutes. Bush Gardens 30 minutes. Disney world and Sea World 90 minutes. Tampa aquarium, planetarium, art museums, live theater,and dog racing are all close by. Even miniature golf. Las Brisas has a heated outdoor pool, 3 Tilki huts to picnic by and outside grills. Price is for 6 only as we only have 1 parking space. Walk the beach or take the trolly to Johns Pass , (About 1 1/2 mile south on the beach). Good restaurants, fishing charters, parasailling, wave runner rentals, boat rental, shelling, dinner cruises, Dolphin tour,Pirate ship tour, or just shop in the quaint shops on the famous Boardwalk. About The Owners: We've been friends (and sisters-in-laws) for 60 years. We've been vacationing in Florida for most of our lives. Started out on th East coast. Once we went to the West coast , we liked the warm gulf water and less high rises. After several vacations up and down this coast, we decided that Madeira Beach were our first choice. We then purchased in 1994. We now make this condo our winter home, now that we are retired. LOVING IT. The beach, three bedrooms, not crowded, family-oriented area, many attractions nearby,etc. , We*ve been friends (and sisters-in-law)for 60 years. We^ve been vacationing in Florida for most of our lives. Started out on th East coast. Once we went to the West coast , we liked tthe warm gulf water and less hiigh rises. After several vacatiions up and down this coast, we decided that Madeira beaches were our first choice. We then purchased in 1994. We now make this condo our winter home, now that we are retired. LOVING IT. One of the largest condos on the beach, 1500 sq, ft. We keep the condo furnished and clean as our home. We spend at least 2 to 3 months here out of the year. Use all of our own quality towels and linens . We have private cleaners and condo is deep cleaned every year when we are here. Try to leave everything we need for our family and friends for you to enjoy. We want you to enjoy our condo as much as we do. Wheelchair fine in all areas except will not fit through bathroom door. Beachfront, Oceanfront. Elevator, Covered parking. The condo had everything we needed with plenty of room. The view of the ocean was outstanding and we watched the sunset from the balcony and even saw dolphins from there. There was plenty to do within walking distance. Working with Betty was great. She quickly responded to every question. We would enjoy staying there again. My sisters and I had a great time at Betty's condo in Madeira Beach, FL. Waking up to see the beach every morning was both relaxing and invigorating. I would not hesitate to book this condo again in the future. Betty was very sweet to work with. Very nice and clean Condo. Exactly as described. Beautiful view of the beach and Gulf. Would’ve liked to have seen a guest register with some instructions on how you want things left and pool restroom codes etc. Would definitely stay again. The description and pictures of this condo were right on target. The condo is very comfortable and the view is awesome. We loved having breakfast looking out at the gulf and watching the dolphins play. We enjoy preparing our meals rather than going out to eat so we were delighted to find everything we needed in the well-appointed kitchen. The owner was fantastic – so easy to communicate with and very responsive to our needs. Our stay in the condo was absolutely amazing. This will be a condo that we will rent again. The view from the balcony is beautiful we saw Dolphins three different days. We were within a five minute drive to John's Pass, restaurants and the grocery store. This condo was the perfect location, spacious, ample comfortable seating great for watching movies as a family. The pool didn’t have a closing time so we were able to grab a late nite swim more than once. Everything about our stay was perfect! Thank you, Betty!! Only 30 Min. from Tampa Airport!